(Four Pack) 2011-10-26 $29.99 ? (Four Pack) 2011-10-26 €? ? 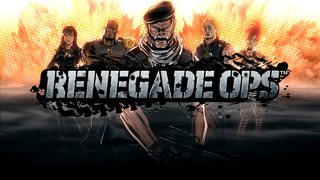 Renegade Ops, called Bakuretsu Gundan Renegade (爆烈軍団レネゲード) in Japan, is a shoot-'em-up developed by Avalanche Studios and published by Sega for Steam, PlayStation Network and Xbox Live Arcade. The game is a free-roaming shooter with a variety of vehicles to choose from, most of which are ground-based. While intended as a download-only release, a physical version was distributed in Russia. Main article: Renegade Ops/Downloadable content. Main article: Renegade Ops/Magazine articles.